Home > Stink bug > What are Green Stink Bugs? The green stink bug, (Chinavia halaris), is commonly found in Northern America, infesting seeds, grains, nuts, and fruits. This pest variety infests on an extensive array of host plants, in both nymph and adult stages, categorizing them as “polyphagous” insects. The green stink bug attacks the fruits in their developing stage, reducing the quality of the fruit or the seed of the host plant. Certain chemical and biological pest management methods can be practiced to minimize and possibly eradicate the green stink bug infestation. The number of times the green stink bug procreates in a year depends on the areas of its distribution. The bug tends to be Univoltine, procreating just once a year or Bivoltine, procreating twice a year depending on whether it is in Northern or Southern areas of the country. A few bugs can be present from May through June of the year, while more tend to appear in mid to late June only to infest the trees in July and August. The life cycle of the insect generally takes 30-45 days. The process of mating of the green stink bug usually transpires during the first few warm days of spring. However, this process can be altered with the level of temperature in that particular environment. 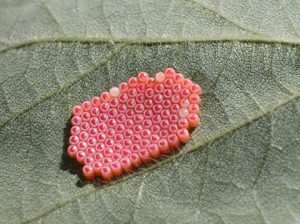 Once the eggs are hatched after about a week and the insect exits the shell, it develops into a full-grown adult pest during five distinctive instar stages. As an insect develops through these five stages, it starts to resemble an adult green stink bug. During cold weather, the undeveloped, young green stink bugs tend to hibernate under debris or under a tree bark until a warmer temperature prevails. Green stink bugs are distributed throughout the United States and adjacent Canada and Mexico. The insect can be found specifically in woodlands, edges, and cultivated land, predominantly from March to November. The green stink bug can be identified throughout its different stages of life cycle. The “keg-shaped” or barrel-shaped eggs of the insect are laid on the underside of the host plant’s leaves in clusters that appear as rows. The eggs are of yellowish green color when they are first laid and they tend to turn pink to gray as they hatch. The eggs measure 1.4 by 1.2mm. Once the eggs are hatched, the nymphs develop through five instar stages in black and red colors. As they reach physical maturity, they tend to resemble the full-grown adult green stink bug. During the undeveloped stages, their bodies are oval-shaped with a distinctive pattern of whitish spots on the abdominal segments. They develop short and nonfunctional wing pads with the maturity. The full-grown adult green stink bug is shield-shaped with fully developed wings. They are light green in color and measure 14-19mm in length. The bugs possess piercing-sucking mouthparts. The straight, orange-yellow margins that border the head and the Pronotum, which is the plate-like structure that covers the thorax of insects, is the most distinguishable characteristic of green stink bugs. 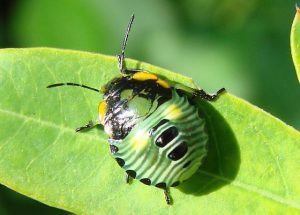 The green stink bug is known for its unique smell. The bug tends to emit a foul, putrid odor that is hard to eliminate when disturbed or crushed. 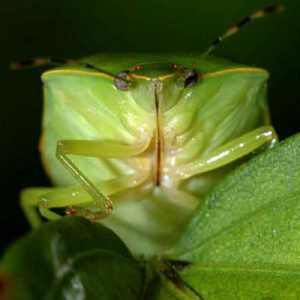 The removal and the preventative methods of the green stink bug can be either biological or chemical. Execution of these methods depends on the extension of the infestation, the type of crop, and the extension of the development of the crop. These aspects of the infestation can be determined by sweeps done by a sweep net. Collect the bugs at each field border into a net and determine what management methods can be used. For example, soybean insect control recommendations-2016 states that the commercial soybean needs control if there are 40 stink bugs per 100 sweeps and pods are still green. The soybean also needs control if there are 20 stink bugs per 100 sweeps and pods are still green. Biological control methods can be executed through the breed of parasites or natural enemies of the bugs namely, birds, toads, spiders, and animals that feed on insects. Species of Hymenoptera and Diptera such as the social wasp, honeybee, bumblebee and ants, can be of threat to green stink bugs. The application of pesticides for control of stink bugs is often warranted. Contact your state Cooperative Extension Service for information since the type of insecticide used depends on the variety of the crop. It is precautionary to consult a professional before usage of these chemical-based products.